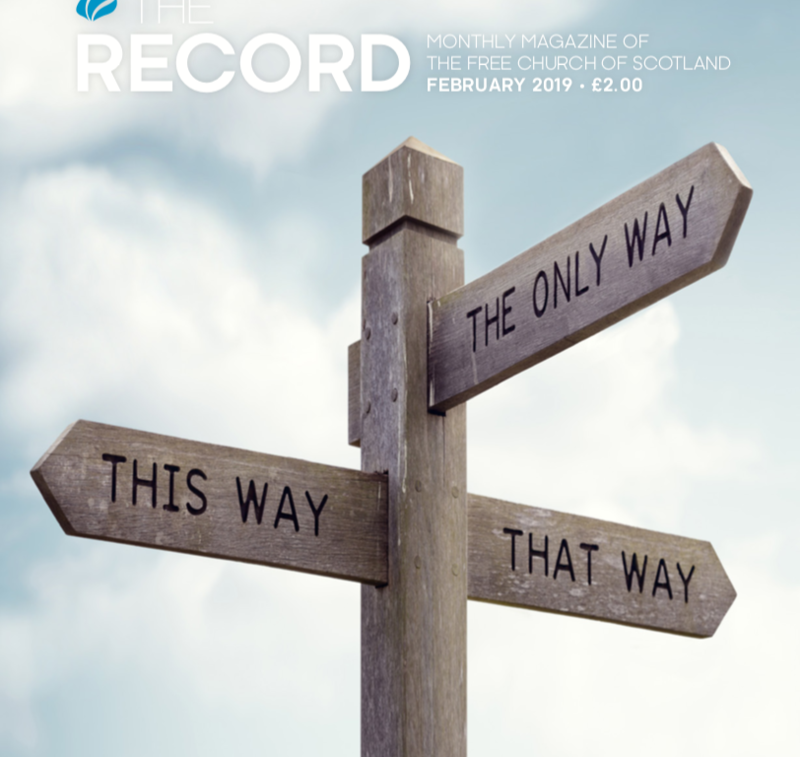 Most Thursdays I do a Brexit update and continue to review The Great Deception – However this week I want to share the editorial from this months Record – just out. It is about Brexit and what is going on in the country – but unlike my blog I hope that you will find it a lot more balanced! Before we post that let me give the latest update. What is the BackStop and why is it so important? I have been asked about this – because the backstop continually gets mentioned. I think there is a great deal of misunderstanding about this – not least about why it seems so important to the EU. The backstop is something that is supposed to prevent a hard border between Northern Ireland and the Republic of Ireland IF a trade agreement between the EU and the UK cannot be agreed. It sounds perfectly reasonable especially when everyone says they do not want it to be enacted. And the EU says it is only being done because they are concerned about peace in Northern Ireland. Given that neither Ireland or the UK will put up a hard border, whatever happens, what is going on here and why is this such a problem? I think there is a great deal of misunderstanding about this. The EU is not primarily concerned about peace in Northern Ireland – which is something of course that we all want – but its a useful tool for them to acquire control of the UK. They want the Backstop in the agreement because they know that in any trade negotiations it becomes their strongest card. Give us what we want or you will lose Northern Ireland forever! The EU always plays hardball – this would give them legally and permanently the nuclear option. Britain would be signing up to something which it could not legally get out of. We would be pointing a loaded gun to our heads and saying to the EU – you can pull the trigger anytime you like. It would make any negotiations about trade a waste of time. We would be just as well saying to the EU – tells us what you want and you will get it – whatever the cost to us, and however ridiculous. In effect it would keep us as a rule taking member of the EU – without having any say in those rules and without having any option to get out. Ever. It is little wonder that the EU leaders only took about 30 minutes to decide up to their dream deal. What is astonishing is how Mrs May and the UK government apparently could not see what they were doing. Mind you perhaps we should not be surprised. Very few opposition politicians and media commentators seem to grasp the significance and importance of the Backstop. Blinded by the EU light they seem oblivious to the political realities of the situation. 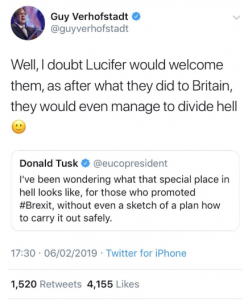 The Free Church does not take a position on Brexit – because the Bible does not. Are we in a time of crisis? At the time of writing – and I suspect by the time this is published – the country seems to be in chaos…or so the papers and media would have us believe. The collective sense of panic and hysteria is not particularly helpful. Headlines screaming that there are going to be a shortage of medicines almost guarantee that people will stockpile and thus create the prophesied shortage. Perhaps we need to take a step back and ask what is going on? Especially those of us who are Christians – because we are called upon to pray for ‘those in authority’. It’s always good for prayer to be informed prayer. The British government last month suffered the largest defeat in history. In these circumstances it would be normal for the Prime Minister to resign and yet the following day she won a vote of confidence. It does seem that in terms of our political leaders there is a great deal of chaos. In an era of ‘fake news’ and ‘misinformation’ it’s good to remind ourselves of the facts that we have. The UK joined the European Economic Community in 1973 without a referendum and public vote. In 1975 a referendum was held to determine whether the UK would leave. Remain won by a substantial majority. Forward to 2016 and another referendum was held. Why? Because the EEC, which had become the EU, had become deeply unpopular. Through a series of treaties it had changed from an economic trading block – the European Economic Community – into a political entity, the European Union. To be fair to the EU, this had always been the intention and was clearly stated. The only problem was that the British people had been lied to by its politicians. We were never asked about any of the changes and frustration increased at the anti-democratic nature of the EU and its ability to impose laws upon us, which we did not decide or vote for. There were enormous advantages to being in the EU – not least because of the Single Market, which Margaret Thatcher called Thatcherism in Europe. But there were also great disadvantages. The free movement of ‘labour, capital, goods and services’ was of great benefit to the wealthy and the corporations – less so to the poor – many of whom saw their living standards reduced. The EU is a technocracy rather than a democracy. It is not, as is often mistakenly assumed, a collective of sovereign national states who co-operate together, but rather a supranational body which requires states to give up much of their sovereignty. National parliaments do not get to vote on EU laws. The EU parliament is the only elected parliament in the world which does not get to propose its own laws. These are proposed by the EU Commission (an unelected body of national commissioners who swear an oath to be loyal to the Commission, not their own elected parliaments). The Parliament and the Council of Ministers only have a right of veto and amendment. The trouble is that the Commission are not accountable to any electorate and cannot be removed by the electorate. This is the great democratic deficit of the EU. As Tony Benn argued – if you cannot remove the people who make your laws, you do not live in a democracy. The tension created within the UK was felt particularly within the Conservative party. In the 1970’s that tension was within the Labour party – the majority of whom were opposed to the EEC – seeing it as an anti-democratic corporate entity. But the genius of the EU is that it governs the nations it rules, not directly but through the institutions and systems of those nations. So you will find that politicians, media, academic institutions, the arts and even major charities are funded by the EU. He who pays the piper calls the tune. The Labour party changed its view towards the EU because of two factors – firstly the rise of what are termed the ‘Islington’ or ‘champagne’ socialists – whereby it became much more the party of middle-class liberals concerned for ‘social’ justice rather than economic. Secondly, the trade union leadership were well funded by the EU. The Scottish Nationalists have morphed from the anti-EU, anti-UK, pro-Scotland party (which is why they were so successful in the fishing constituencies who had been decimated by the Common Fisheries Policy) in the 1970’s to being the most pro-EU party in the UK (alongside the Liberal Democrats). The real problem/opportunity for those who wanted to leave the EU was seen to be in the Conservative party. But as it in practice split over Mrs Thacher’s increasing EU skepticism (which resulted in her dismissal) there was a view that the Tories would really do nothing about the EU. In effect, apart from the extreme right (the BNP) and the extreme left (the Communists) there was no political voice for those who wanted the UK to be independent from the EU – until UKIP (the United Kingdom Independence Party) and Nigel Farage came along. Although in the 2015 election they only got one seat (because of the first-past-the-post system), they received 3.9 million votes. This was enormously damaging to the Tories, whose leader, David Cameron, promised to have an EU referendum in order to deal with UKIP. The Houses of Parliament voted by a large majority to have an in/out referendum which we were solemnly promised would be a once-in-a-lifetime vote, and would be acted upon. No-one expected Leave to win. All of the major political parties, the majority of the media (with notable exceptions in the print media), the CBI, the Trade Unions, the arts, academic and church establishments (almost every Church of England bishop and the Church of Scotland General Assembly made it clear that God was pro-EU!) were opposed. And then the unthinkable happened. The British people voted to Leave the EU. 16.1 million voted to Remain; 17.4 to Leave. It was a seismic shock to the whole political system. The Establishment struggled to cope. Most politicians said ‘we respect the result’. At the 2016 General Election over 80% of the votes went to parties who promised in their manifestos to enact the result of the Referendum and take the UK out of the EU, including the Single Market and Customs Union. But the process had already begun to reverse the decision. As a result the divisions in the country only deepened. Voting for Brexit was deemed to be dumb populism – equivalent to voting for Donald Trump or fascism. On the other hand those who voted Remain were accused of being traitors to their own country. The people who voted Leave were accused of being ignorant, deceived, lied to (of course those who voted Remain were intelligent enough to see through the lies!). Even the Russians were blamed. We must have another vote, the cry went up. The EU, which has never accepted the result of any referendum which went against its wishes, played hardball and refused to concede anything. The British government, led by Mrs May, has proven to be totally inept in dealing with the EU – signing up to pre-conditions which guaranteed that it would be impossible to get a good deal. After two and a half years of this mess – with well-financed Remainers getting increasingly emboldened, and a government led by a those who voted Remain, seeking to negotiate Leave with an intransigent EU – an agreement was finally come to. This was the agreement that was so overwhelmingly defeated in the House of Commons. What happens now? The truth is, nobody really knows. Some think that some form of Mrs May’s deal will get through, others hope (fear?) that there will be a no-deal Brexit, some want what is termed BINO (Brexit in Name Only), and still others hope to reverse the results of the referendum by having another one (although there is no guarantee that the British people would vote any differently). 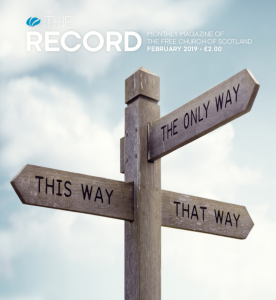 The Free Church does not take a position on Brexit – because the Bible does not and we have no right to speak on behalf of our members when the same political divisions in the culture are reflected in our own views. We can however observe the weakness and lack of leadership amongst our political leaders, and the increasingly bitter divisions within our country. We can cry out for mercy to our sovereign God. A great deal of this argument is about sovereignty. 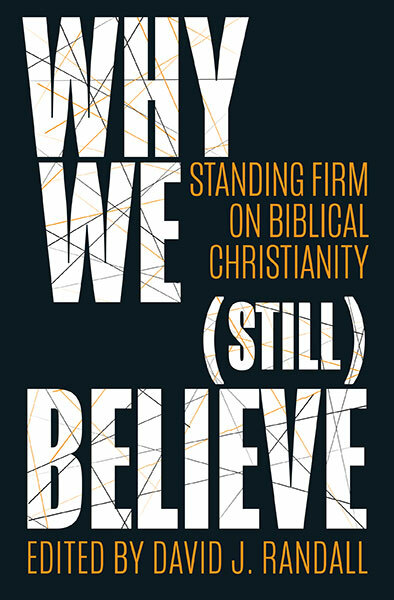 The Christian perspective is that sovereignty does not lie ultimately with Brussels, or Westminster, or Holyrood, or even the people. Only God is sovereign – and only he can, in his mercy, save us from ourselves. May it be that our churches and people regularly intercede before the throne of grace. Almighty God, who has given us this good land for our heritage: We humbly beseech You that we may always prove ourselves a people mindful of Your favour and glad to do Your will. Bless our land with honourable industry, sound learning, and pure manners. Save us from violence, discord, and confusion; from pride and arrogance, and from every evil way. Defend our liberties, and fashion into one united people the multitudes brought here out of many kindreds and tongues. Endue with the spirit of wisdom those to whom in Your Name we entrust the authority of government, that there may be justice and peace at home, and that, through obedience to Your law, we may show forth Your praise among the nations of the earth. In the time of prosperity, fill our hearts with thankfulness, and in the day of trouble, suffer not our trust in You to fail; all which we ask through Jesus Christ our Lord. Amen. Below is a list of whats in this month! I am sure I am being stupid here, but why “Give us what we want or you will lose Northern Ireland forever!”? The EU wants the UK to be subject to its rules and parts of its customs union so that it does not become a rival economy of its coast. It wants the UK to keep paying into the EU. But if they can’t have that then they want us to be as independent as possible. They don’t want us to have access to the single market without instituting the four freedoms. Their whole negotiating stance is that there can’t be any compromise on the four freedoms. The U.K. government seems to want freedom of goods, capital and services, but not labour. The EU does not want to compromise the single market by allowing member states or ex member states to have a pick and choose approach to these. Perhaps the EU wants to be in control of its borders including the new one in Ireland. I thought that prayer didn’t sound very Cranmerian – it’s from the American 1928 Prayer Book, and some apparently misattribute it to Thomas Jefferson. Given you don’t usually have a lot of time for Bishop Curry’s Church, you may still be happy to use their prayer (and I’d think well of you if you did, when you obviously agree with its sentiments) but I wouldn’t want your readers struggling to find it in the 1662 Prayer Book! I’m not sure the article really explained the backstop. How do you solve the Northern Ireland question? Where do you draw the border? The border is there. It will stay as it is now. 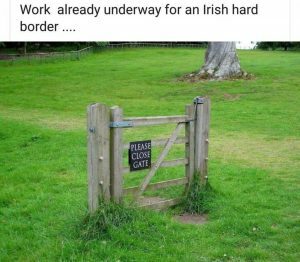 The UK won’t put up a hard border. Would the Irish? It’s all bluff and bluster. There is no question to solve if the EU stop trying to control UK trade. How do the UK and EU control their borders without having a border? If we don’t have a meaningful border between the UK and EU then what is the point of leaving? Most of the tory party (who are the people calling the shots and composed the bulk of the leave campaign) do indeed see brexit as primarily about immigration. As much as I would like to see a world without borders, I’m not sure how that is actually feasible. How does Ireland or the UK maintain any sense of control over their trade policies if there is an open border? What is the point for example in putting tariffs on something if I can just ship it to Dublin and drive it across the border? Most countries will use their border to ensure people aren’t coming to work illegally – ie the border will ask for returning flights, evidence of funds, etc. What is to stop Europeans from seeking illegal unemployment in the UK by going through Dublin? These aren’t the issues I really care about but a lot of Brexiteers do seem to be concerned about these issues of sovereignty. Previous Previous post: In The Market – with Janet Parshall – Politics, Ethics, Theology..